The reaction to Sekiro: Shadows Die Twice has been somewhat muted, as it's changing a lot of what people expect from a FromSoftware action game. However, in this lengthy look at gameplay of the studio's new title, the game appears to still have some Souls DNA. It's clear that the action is more fast-paced, and it looks as though you'll have lots of options at your disposal when in combat. The new death mechanic is shown here too, where instead of respawning at the last bonfire/lantern, you can resurrect yourself on the spot to get the jump on enemies. You won't be able to do this endlessly, so there is an element of strategic use. We're definitely interested to see more of Sekiro in the run up to its release in March 2019. 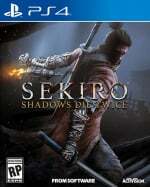 What do you think of FromSoftware's new game? Grapple hook your way to the comments below. said it before but i am happy that this is not a souls like game. this game still looks great,and it seems that the combat is still a great part of the game. sure dark souls is fun but after a while that whole concept gets old. Pacing wise it looks to be somewhere between Dark Souls and Bloodborne, which I dig. Also, I love the more assassin style movement and attacking. This is going to be a classic, right? People will be screaming for a sequel to this in four or five years. @pimpjuice Bandai has a lot of games with MTX, and Activision has a lot of games without them. They are both companies that want to make money. Also, there is no way there is going to be MTX in this game. @Kidfried it could be a classic,all depends if the souls fans that are angry about this not being a souls like game finally realise that from software can make other great games besides dark souls and bloodborne. @Kidfried I have to disagree. What are those coin replicas in the collectors edition supposed to represent? Chocolates? I'm unsure whether to do a media blackout for this one or not. On the one hand, some spoilers like about that certain item you should get 3 times in Bloodborne is practically necessary to know beforehand, so some things can help, but at the same time, if this game won't need things like that, I'd love to be satisfied with just the reveal trailer as I have no doubt this game will be amazing. @LaNooch1978 In-game currency. Just like Dark Souls, just like Bloodborne. The fact that the collector's edition comes without any digital currency is rather a confirmation that there will be no MTX. @Jaz007 I'm very cautious as well. I like looking at some gameplay basics, but I'm definitely not hanging around until a possible boss section or something similar spoiler territory. @Kidfried Again,I think you are wrong but I hope you are right. @LaNooch1978 Haha, yes, we will speculate about this until the game's release probably. I hope to have a better income by then, not to buy any loot boxes, but because I would love to play this on Day 1. Kinda looks like Metal Gear Souls. @Kidfried @LaNooch1978 A Fromsoftware game with Microtransactions will get so much flak. It could ruin the games hype and reputation honestly. If they're smart they won't, especially because the crowd that buys these games is likely to care.I also question whether From would work for someone who makes them do something like that. @Jaz007 I don't doubt that you are correct and I don't think that there will be loot boxes. But in-game currency is all but confirmed at this point and the fact that Activision are involved makes me think that more of this currency will be available for real-world cash even if it is only to allow for the purchase of cosmetic items. @Jaz007 From already confirmed they have full creative control on anything in and surrounding the game too. I'm completely with you. @Kidfried Activision/Blizzard makes about half its money from microtransactions. Where are you getting your information from? @AyanamiReign Miyazaki in an interview considers the main character more of a ninja than samurai. I will buy this but I’m not excited for it one bit. I found Nioh beyond boring and this looks so similar. Loved the gameplay trailer and so happy we finally have a release date! Will stay tuned for future news regarding this game. Looking good! Praise the fun. I'm surprised by how different it actually looks in real-time gameplay, with the crazy mobility and proper stealth, a true magic ninja game. This looks really bluddy good. Looks more like an evolution of Souls than the complete departure people have been describing. I’m even getting a slight Tenchu vibe from it with the stealth and grappling hook. @LaNooch1978 But that's only about two console games at any given moment, and that's only their multiplayer games. @Kidfried Granted. But as a company they are still beholden to shareholders who will want to know why a golden opportunity to make money was missed in this instance if microtransactions are omitted. I don't understand why they would leave them out (especially if they don't alter the gameplay in any meaningful way) or why you are so keen to believe that Activision of all companies,with their track record of greedy corporate skullduggery,would pass up an opportunity to make a bundle of easy money when one so clearly exists. Aye looks good, looks like ghosts, this and nioh 2 will be really different despite any similarities in setting. @LaNooch1978 Why? Because Miyazaki has already said that those decisions are not Activision's to make. From remains in full control of their game. And Sekiro is not a golden opportunity: it's a single player game, a new franchise, it has no RPG element like other From Software games and it wont sell millions. It's in no way like Destiny or Call of Duty. There has been nothing announced yet, and no pre order bonuses either, which all but confirms that there won't be anything like it. But I've made that point now. You can choose to liken this game to Destiny to make your argument that there will be MTX, but just know you're acting on fear instead of reason. @Kidfried Look at the gameplay demo. It has upgradable weapons and gear. It has in game currency.Do you want a road map? I admire your loyalty to FromSoftware and Miyazaki (which I share BTW) but the fact is that money trumps artistic integrity in the videogame industry almost every time. But enough. Let's wait and see. Loser buys a cake for the other? @LaNooch1978 If you win, I'll be sure to buy you some premium souls or those Crash Bandicoot cosmetics. @Kidfried Haha. Deal. I do prefer cherry bakewells,though. Looks good so far. The only thing comparable to a souls game might be the difficulty. The jumping and grappling hook mechanic is a huge change to fighting, in a good way I hope. It should give us more options to attack/avoid. @LaNooch1978 I'm not British, so I had to Google the name, and those cakes must be amazing. Definitely going to make one of those sometime soon. I'll let you know how it went down. @Kidfried They are super delicious.And easy to make too! I hope this is nothing like Dark Souls, I suuuuuucked at those games! @LaNooch1978 Just because a game has in-game currency does not mean it WILL have microtransactions. Ditto just because the publisher is Activision. The Dark Souls games have upgradeable weapons but yet have no microtransactions. And what exactly do you mean by in game currency. The stuff you collect when defeating enemies, just like in the Dark Souls games? As @Kidfried said From Software have full control over the game, I will be very surprised and disappointed if there are microtransactions in this game. Anyway, rant over lol. This looks superb. Watched the VaatiVidya video and his feedback sounds really promising. Roll on next March. @JohnnyShoulder See my comment #25? That's what I mean. Blimey. Anyone would think I was advocating for microtransactions in games. I'm not. I'm saying that Activision are unscrupulous nozzles and there is no reason to think that just because this is a Fromsoftware game that they will suddenly become all warm and fuzzy and forget that they need to earn profits. @LaNooch1978 Yeah I saw that comment, that still doesn't mean microtransactions will be in every Activision game, and that is a very one sided and cynical view to take. I'm aware companies such as Activision, Ubisoft and EA like to insert them. Or any companies for that matter. But the trend so far has been that most games with microtransactions have a strong multiplayer focus. I doubt very highly they are going to put them in Sekiro, because they would instantly alienate a majority of fans that would be vocal about it and risk lower sales. Miyazaki has said this has been built from the ground up to be an offline single player title, that doesn't sound to me like the sort of game to have microtransactions. @JohnnyShoulder I've said multiple times that I hope I'm wrong. But just look at this company's track record with things like the Call of Duty Remaster debacle or even the recent Spyro Trilogy balls up(which I contend was designed to prevent people buying second hand copies) and you will see that time and again they resort to shady anti-consumer practices to turn a quick buck. Has this made me cynical? Sure. But if the day comes when the game releases loaded with Microtransactions or pitiful paid for DLC, I won't be upset and you'll be sobbing into your cornflakes. So let's just wait and see. @LaNooch1978 It's a turn of phrase. I couldn't care less what kind of breakfast cereal you like.